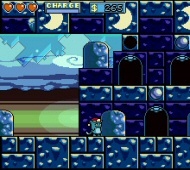 A Game With A Kitty is a great "short but sweet" 2D platformer that harks back to the good old days of SNES games. Although the game is quite short (it will take joystick experts only about 1-2 hours to finish), you will have a lot of fun while it lasts. Beautiful 2D graphics, smooth animations, interesting NPCs to talk to, and even a non-linear gameplay make it yet another commercial-quality release from Fallen Angel Industries. Even with the short length, the game manages to sustain my interest throughout with cool new abilities (like the "glide" one) that my kitty would discover every now and then. The game was made in a mere 2-week period according to the designer - an amazing feat given the high quality. If you like platformers in general and have no problems with games with 'cutesy' graphics, take a look at this very well made and thoroughly fun underdog.